With clients all over the United States, Canada, Europe, Africa, and South America, Jim has offered his unique perspective of astrological analysis to his clients since 1984. Having an extensive and comprehensive background in metaphysics, personal development and spirituality, his astrological interpretation is strongly grounded in a holistic framework. He is a Level IV Certified Astrologer in NCGR-PAA, National Council for Geocosmic Research - Professional Astrologers Alliance. He served as President of the Oklahoma Chapter of NCGR for several terms. Jim has taught numerous classes in astrology since 1984 as well as a variety of workshops on personal transformation. He was on the Board of Directors of the Oklahoma Metaphysical Society, OMS, for nine years, and served as its President for seven. 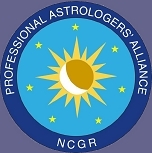 His philosophy of astrology is one of "Positive Process" in which each aspect of the natal chart is seen as working towards a beneficial expression in the person's life. He is currently writing a book entitled "The Secret of Happiness" based on his experiences in non-dualistic studies.